Store at controlled room temperature 59° -86°F (15°-30°C). call 1-888-784-3335 (STIEFEL). 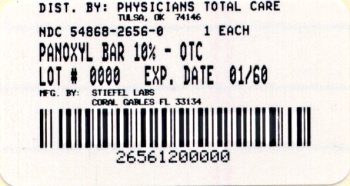 Side effects associated with use of this product may be reported to this number. Now you can take control of your acne with Maximum Strength PanOxyl® Acne Cleansing Bar, the highest strength of Benzoyl Peroxide (BPO) available without a prescription. The Benzoyl Peroxide in the PanOxyl® Acne Cleansing Bar is the same medicine prescribed by dermatologists. The convenient bar form of PanOxyl® gently removes dirt and excess oil to cleanse and unclog pores, making it an excellent choice for the management of acne on the face, chest and back. Now you can take control of your acne with the PanOxyl® Acne Cleansing Bar. The 5% Benzoyl Peroxide in the PanOxyl® Acne Cleansing Bar is the same medicine prescribed by dermatologists. The convenient bar form of PanOxyl® Acne Cleansing Bar gently removes dirt and excess oil to cleanse and unclog pores, making it an excellent choice for the management of acne on the face, chest and back. 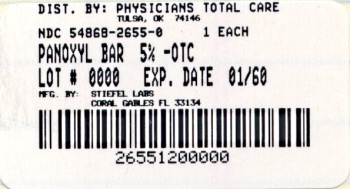 PANOXYL is a registered trademark of Stiefel Laboratories, Inc.